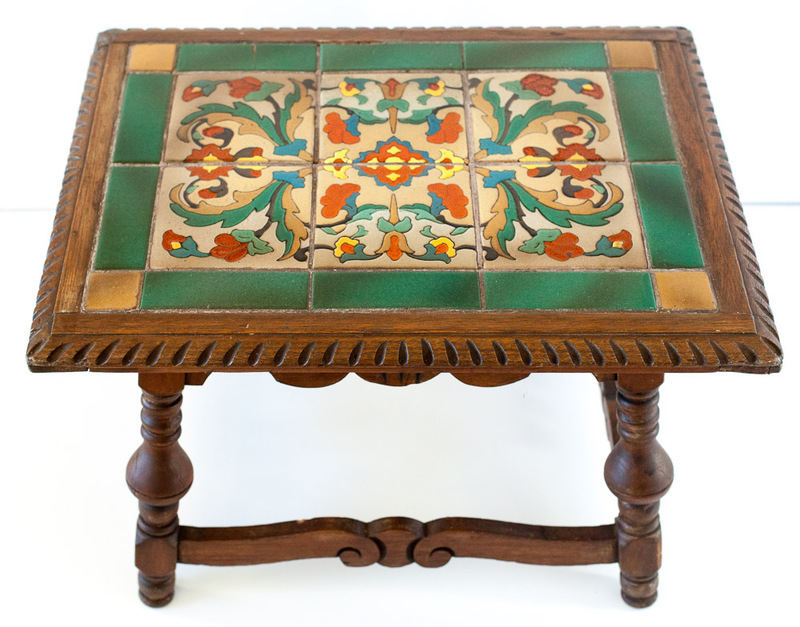 This is one of my favorite floral geometric tile tables. 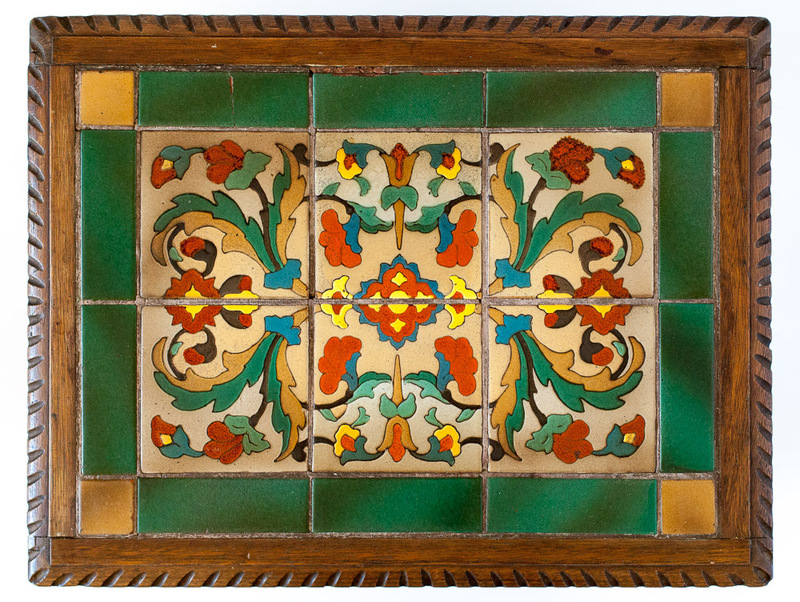 I had to reach out to a number of tile experts to identify it until a few finally confirmed that it was made by Taylor Tilery (1930 - 1941). 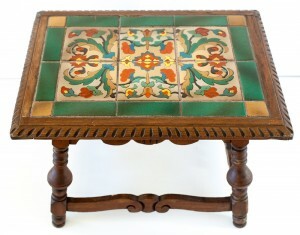 Cuerda seca technique was used to separate gorgeous matte glazes that decorate six light-beige tiles surrounded by green border tiles and contrasting light-brown corner tiles. The mottled red glaze is particularly pretty. This style of decoration is characteristic of both Taylor and Malibu Potteries (1926 - 1932). 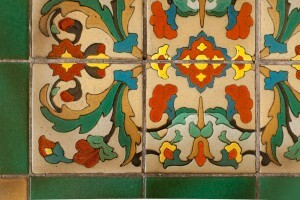 You can see similar Malibu tiles on pages 228, 229, 234, 237 of the Encyclopedia of American Art Tiles, Region 6. Page 57 of the California Tile, The Golden Era 1910-1940 (vol. 2) also shows some Malibu examples that are close in style. However, after Malibu factory closed in 1932, Taylor hired Bill Handley, Malibu's head of design, and with him came his know-how, decorative skills, and even some of Malibu's designs. Some of Taylor's tiles bear a striking similarity to earlier Malibu examples, as shown on page 166 of the Golden Era 1910-1940 (vol. 2) or page 265 of the Encyclopedia of American Art Tiles, Region 6. 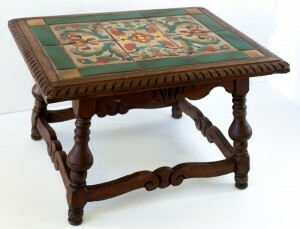 This last example has the bright blue glaze that is very similar to the one used in my table. I couldn't find this exact design in either of the two companies' catalogs, and both had created a number of very intricate floral designs. The woodwork of the table itself is also very well-done - the table has turned legs and carving at the top of the table, on the apron, and on the stretchers between the legs. There is some damage to three of the solid-color border tiles but fortunately none of the decorated tiles are damaged or even scratched.